Parkside Community College is a secondary academy school with 600 places for children aged 11–16, situated in Cambridge, Cambridgeshire, England. It is part of the Cambridge Academic Partnership, along with Parkside Sixth, Coleridge Community College, Trumpington Community College, and Cambridge Academy for Science and Technology (formerly UTC Cambridge). The college has two specialisms in arts and languages. The College is situated in the centre of the city, north of Parker's Piece. Parkside was the first school to be designated a specialist media arts college in 1997, under the UK government's specialist schools programme. It has developed a second specialism in Modern Foreign Languages. Although called a 'community college', it is neither a community school nor a college but had foundation status since 2003 and became an academy in 2011. It is situated east of the A603 and next to the main Cambridge Parkside police station and the National Express coach stops. It is east of Emmanuel College, Cambridge. The school was first opened as a higher grade school in Melbourne Place in 1913, providing places for about 820 boys and girls; fees between 6d and 9d a week were charged. Following the Education Act 1918, it became a central school. From 1960 to 1974 it was the Cambridge Grammar School for Girls, after which it became the co-educational comprehensive Parkside Community College. It was the first school in the UK to be designated a Media Arts College under the UK government's specialist schools programme, in 1997, and was granted Foundation status in 2003. In 2005 Parkside Community College formed the Parkside Federation with Coleridge Community College, which had then been placed in special measures. The school achieved Academy status in 2011 when the federation converted to a multiacademy trust. At the same time it opened a new sixth-form college, Parkside Sixth. In 2017 the trust changed its name to the Cambridge Academic Partnership. The history of the school is related in An Epoch-Making School, by former Deputy Principal Rosemary Gardiner (1983). Its work as a specialist media arts college has been documented in a number of research studies by staff at the school. These include studies of an extensive primary school animation project (e.g. Burn and Parker, 2001), run in conjunction with the Cambridge Film Consortium, a group composed of Anglia Ruskin University, City Screen (an Arts cinema chain), the Cambridge Film Festival, and Parkside itself. A comprehensive account of the school's media work, giving examples of work in digital video, computer games, animation, and television drama, as well as work across the curriculum, is provided in Andrew Burn and James Durran's Media Literacy in Schools (2007). 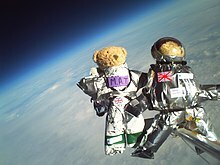 On 1 December 2008, the Nova 9 helium balloon took two space-suited teddies close to the edge of space from the grounds of Churchill College, Cambridge. The space suits were designed by 11–13-year olds at the school. The journey took just over two hours. The teddies descended back to Earth and landed near Ipswich, being located by GPS equipment. Parkside Community College achieves GCSE results that are consistently among the best for state schools in Cambridgeshire. The author Nick Hornby was an English teacher at the school between 1982 and 1984. ^ "British History Online: The city of Cambridge schools". Retrieved 24 February 2016. ^ "City of Cambridge Education Foundation". Retrieved 24 February 2016. ^ "G4 sing way to semi finals". Archived from the original on 14 December 2013. Retrieved 14 December 2013. ^ Snead, Florence. "Cambridge school Parkside Community College welcomes writer Nick Hornby for Q&A session"[permanent dead link], Cambridge News, Cambridge, 14 November 2014. Retrieved 21 May 2016. This page was last edited on 15 January 2019, at 06:59 (UTC).